Tradition has given a colloquial name to Holy Wednesday, Spy Wednesday. Our Lord returns to Jerusalem and Sacred Scripture tells us that the Sanhedrin plots to kill Jesus but fears the people. The gospels explain that it is today that Judas agrees to be a spy and provide information to the Sanhedrin for thirty pieces of silver. 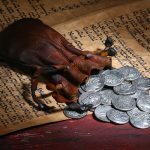 Sacred Scripture explains that thirty pieces of silver are the price of a slave (Exodus 21:30) or the labor of a shepherd (Zechariah 11:12-13). Both St. Matthew and St. Mark agree that the last straw for Judas was the anointing at Bethany (Matthew 26:6-13 and Mark 14:3-7). Only St. Luke indicates that Judas’ betrayal is a result of Satan entering into him which then drives him to betray our Lord. The stage is set and the final confrontation begins tomorrow as the Holy Triduum begins.